Some people call California “the land of fruit and nuts” as if it’s supposed to be an insult. I can tell you right now if there is a land of fruit and nuts, that’s where I want to be! 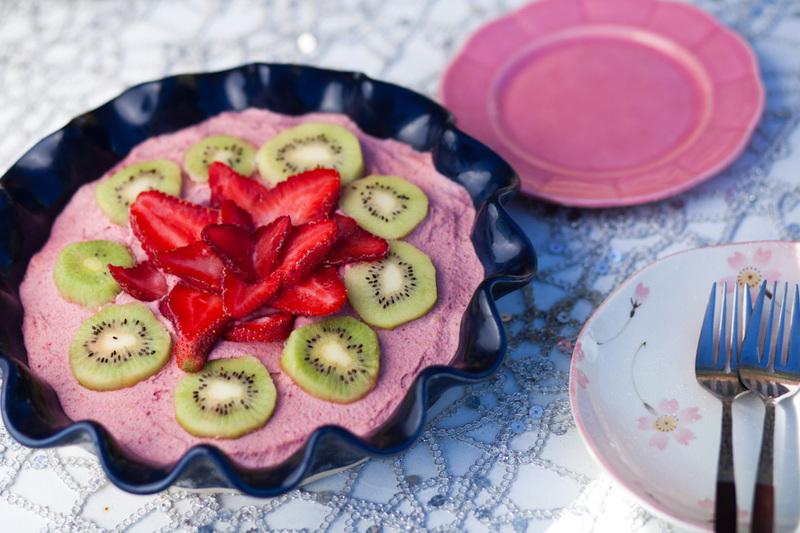 This delicious raw vegan strawberry cheesecake is made almost entirely of fruit and nuts, plus a half cup of oats and some spices. It’s so simple and so delicious. Light, creamy raw vegan strawberry cheesecake in a flavorful pecan crust. Topped with fresh fruit and made with love! If your dates are the large soft medijool kind, you are good to go. If they are the smaller kind that is dry and hard, soak them in warm (not boiling) water for 15 minutes before you begin. In a food processor or vitamix, combine the pecans, oats, salt, cinnamon, and half a cup of dates. Blend until the mixture is soft but grainy. Press the mixture into the bottom of a large pie or tart pan. Again in a processor or vitamix, add the strawberries, cashews, dates, and maple syrup. Blend until smooth and creamy. Layer the strawberry mixture on top of the crust. Smooth the layer out, then decorate with strawberry and kiwi slices. Freeze for at least 3 hours to set the raw vegan strawberry cheesecake. *20 minutes indicates active time only, not the soaking of the cashews or freeze time. I like to keep soaked cashews on hand in the freezer to speed things up. I know it’s hard to wait three hours to eat this raw vegan strawberry cheesecake. But I promise it’s worth it! Make it before dinner so it can chill and set while you eat. Then pop that baby out of the freezer and devour it all with no guilt! It’s raw AND vegan with no refined sugar. I call that a win. Did you make this recipe? We wanna see! Post a photo on Instagram with the tag #carrotsandflowers 🙂 Be sure to follow us there too @carrotsandflowers so you’ll be the first to see when we have new recipes up! For other simple, healthy dessert options, check out our raw vegan strawberry ice cream or our California Dreamin’ vegan granola cookies, aka the world’s most delicious cookies (even better than chocolate chip)! Could this recipe be made with extra firm tofu in lieu of cashews? I really hate cashews!! Wow, love your blog!! Well done :). And this pie looks delish! Thank you Lisa! That means so much! 🙂 Please let us know if you try making it! do gluten free oats work? absolutely! that’s what we use too. I’m allergic to strawberries. What other fruit would work with kiwi- maybe blueberries or cherries? Yum, I bet both blueberries and cherries would be delicious!! Any alternative to oats? I’m not a fan 🙂 Almond meal maybe? Can i use honey i stead of maple syrup i dont have any? Thanks´s for this interesting récipe. After freezing for 3 hours do you put it in the fridge or leave it in the freezer over night?? Do you put it to the fridge or freeser? I recommend putting this in the freezer to set for at least three hours. We usually eat it frozen, but if you prefer it a bit softer, let it sit on the counter for about twenty minutes before serving. Enjoy! I just made this dessert. So delicious. It didn’t turn out as thick. Also, I froze as suggested but the fruit froze as well, next time should I put fruit after I take it out of freezer? Also, when it thaws a bit it’s not as firm so falling apart a bit, any suggestions on the best way to serve? Yay, we love hearing when people make our recipes! To make it thicker, you can swap the maple syrup for 5-6 extra dates and add an extra 1/4 cup of cashews. We usually eat the dessert frozen, but if you aren’t a fan of frozen fruit, you can absolutely slice fresh fruit to layer on top of the cheesecake after it’s frozen. For serving, it slices best when it’s frozen or thawed for only about 10-15 minutes. Hope this helps! Thank you so much! Yes, it slices very good frozen. I let it sit in the plate for half hour and it was perfect! ! Have you tried with soaked Irish Sea Moss? I added 1 TBSP of the gel. do the rolled oats need to be cooked before? They don’t! That would make the consistency quite strange.